In Massachusetts, there are nearly 500 structurally deficient bridges. Drivers pass over them 10 million times a day. Are bridges inspected enough? Across the country, bridges are crumbling and collapsing. More than 50,000 bridges are falling apart, including nearly 500 in Massachusetts. In December, a New Hampshire woman on her way to work in Boston was hit by falling debris in Newburyport, Massachusetts, under the Whittier Bridge. It shattered her sunroof. NBC10 Boston's Investigators checked area bridges. 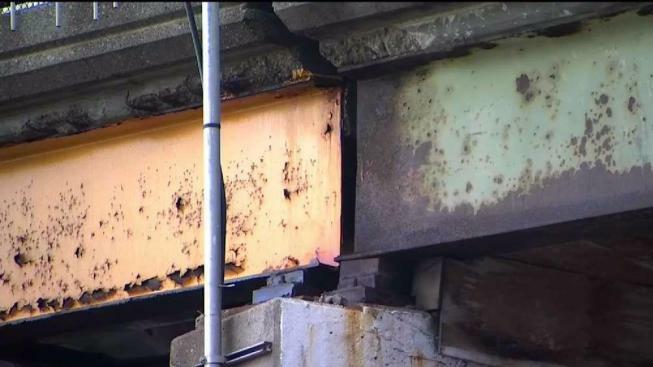 For example, under the Massachusetts Turnpike bridge near Boston University, concrete is crumbling top to bottom, steel is rusting and corroding. We also found holes rusted through in support beams. Ilyas Bhatti is the former commissioner of the Metropolitan District Commission and oversaw bridges in the state for years. He now teaches at the Wentworth Institute of Technology. Bridge data from the Massachusetts Department of Transportation Highway Division Bridge Inspection Management System. "All the infrastructure is getting a D or less than D," he said. "Overall the state is not very good." A new report from the American Road & Transportation Builders Association shows how bad it is. According to government data, 54,259 bridges are "structurally deficient." "Until there’s an emergency, no action is taken," Bhatti said. "Inspections are done but should be expanded." The Massachusetts Department of Transportation declined to allow NBC10 Boston's Investigators to go along on an inspection. Some bridges have signs saying no trucks over the bridge or no trucks over six tons. Experts say at the current rate of repair on bridges nationwide, it would take 37 years to fix the country’s bridges. Some of the Massachusetts bridges on the list date back to the 1850s. They were not built for today’s traffic or 18-wheelers. The bridges are crumbling, in need of repair. New technology may help speed up the process. Those drones take pictures all over the bridge, including underneath, so engineers can more quickly diagnose the problems. Some of the bridges have been on the list with repairs not made for years.